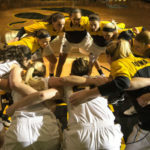 Last night the Hawkeyes Women’s basketball team defeated the Colorado Bison at Carver-Hawkeye Arena 80-62 to advance to the Elite Eight in the WNIT bracket. The Hawkeyes benefitted from 49% shooting from the floor and 36% from deep. The big contributors for the Hawkeyes were Senior guard Ally Disterhoft and Sophomore center Megan Gustafson. Disterhoft had 15 points, 4 assists, 3 rebounds and 2 steals while Gustafson had 12 points and 8 rebounds. But the biggest story of the night was Alexa Kastanek coming off the bench and shooting 7-11 from the field and 5-9 from deep, totaling in a game high, and Kastanek’s season high of 19 points. cliché, the 36% doesn’t tell the whole story. In the second and third quarters, Iowa was able to hit three after three to build their big lead, at one point going on a 17-0 run in which Kastanek hit 3 threes. Gustafson’s big game against South Dakota St. was a major reason why. Defense was another area where the Hawkeyes shined, holding the Bison to 39% shooting from the floor and holding the first-team all-Pac-12 Sophomore Kennedy Leonard to just 2-14 shooting and forcing her into 6 turnovers. Turnovers were another positive for Iowa, creating 18 turnovers while giving up 14, 7 of them in the fourth quarter when the game was well in hand. It was also a big win for Iowa’s head coach Lisa Bluder, who won the 699th game of her career. 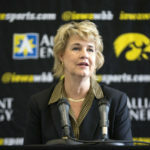 She currently sits 29th all time for women’s college basketball coaching wins. Both Bluder and her players were very happy with the crowd at Carver-Hawkeye last night. The Hawkeyes hope to keep up their tournament run Sunday afternoon at 2 pm at Carver-Hawkeye Arena. 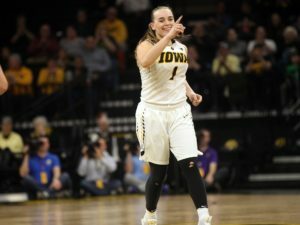 It will be the Elite 8 of the WNIT tournament, and the Hawkeyes will play Washington St. (15-19), as they come off their win against UC Davis. A win for the Hawkeyes will be Bluder’s 700th all-time win and mean a trip to the WNIT final four.